Last week, my coworker brought me the most amazing present: 4 humungous homegrown summer squashes. I was so delighted. I was even more delighted that she read my food blog! She requested that I post about whatever dinner I made with these gorgeous gourds in exchange for an endless supply of veggies from her garden. That didn’t seem like too much to ask. 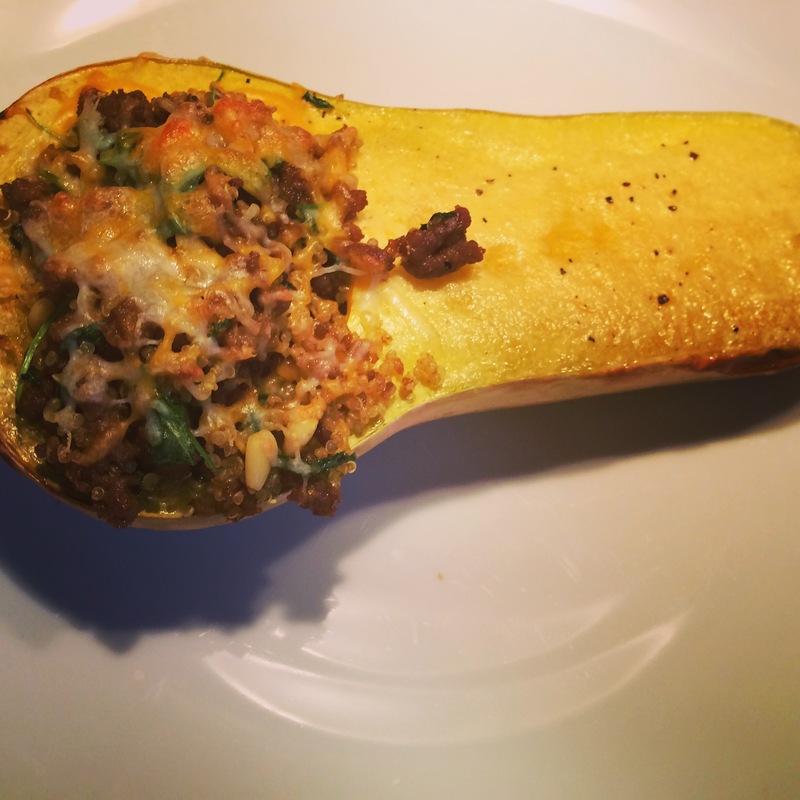 Stuffed squash isn’t just for the winter. In the summer, your grocery store shelves (and coworkers’ gardens?) will be full of many types of summer squash. This particular squash has a similar taste and texture as butternut squash, although I’m not actually sure what this squash is technically called — it looks like a green butternut squash — but what’s in a name? A summer squash by any other name would still taste as sweet… ok, let’s get onto the recipe! The first thing to do is to roast the squash. Heat the oven to 400 degrees, and prepare the squash. 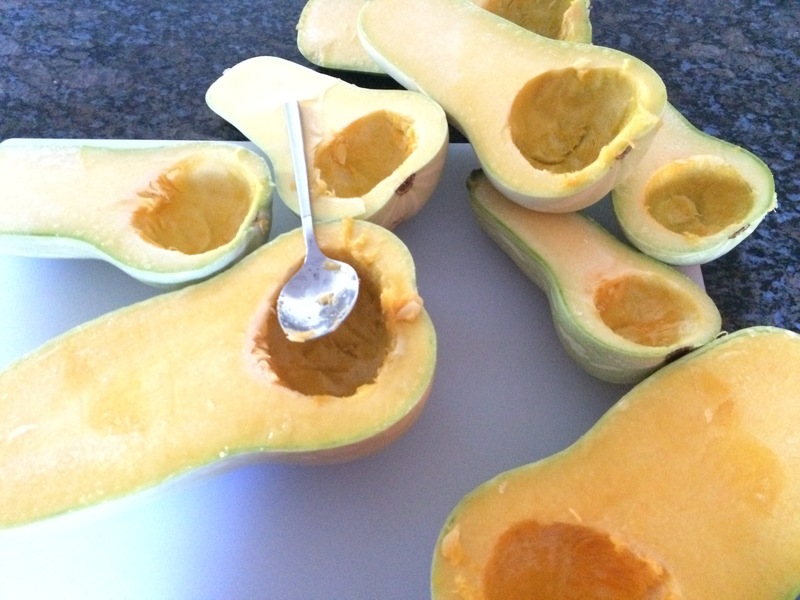 Halve the squash and use a spoon to take out all the seeds. Roasting the squash will take a while, and the amount of time the squash roasts depends on its size. 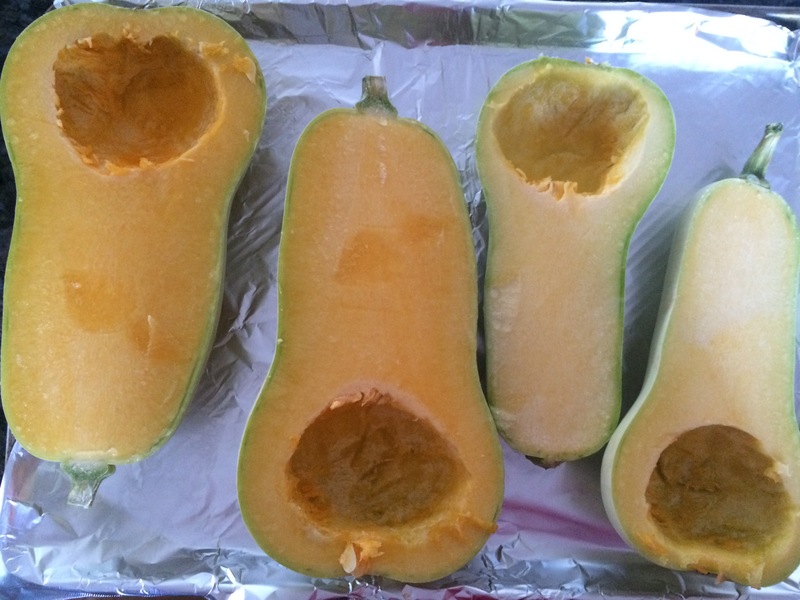 Put the squash facing up on an aluminum foil-lined cooking sheet. Divide 1 Tb. olive oil between the four halves, and rub it into the skin. 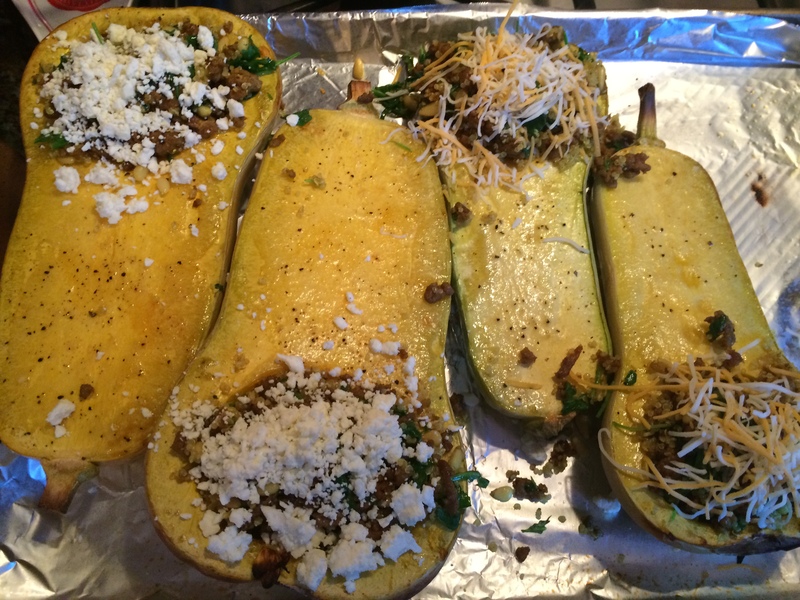 Sprinkle the squash with 1 tsp. kosher salt and a sprinkling of black pepper. 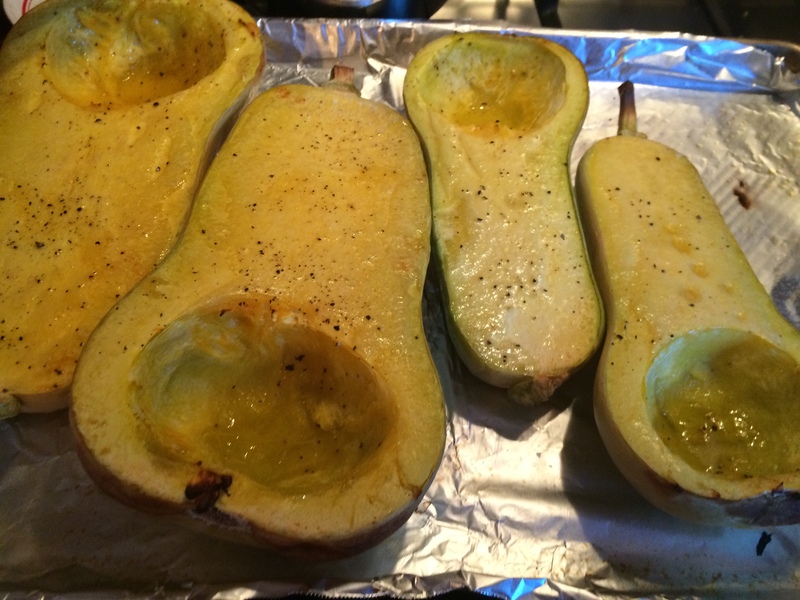 Put the squash in the oven, and check on them at 40 minutes. They may be done, but they may need 20 more minutes. You can check the done-ness of the squash by sticking a fork in them — if the squash is still hard, they need more time. Ask yourself, do I want to eat this? If the answer is no, then cook them longer. 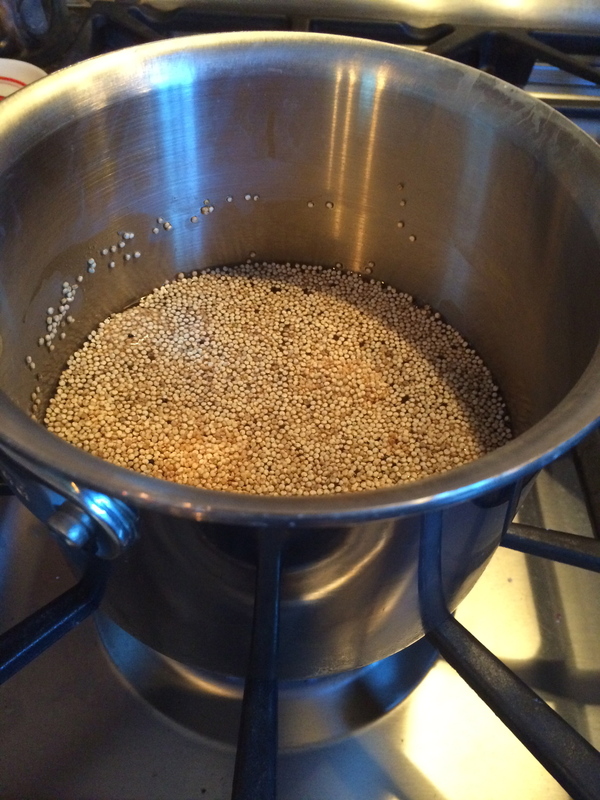 While your squash is cooking, make your quinoa. Follow the directions on the packet. It takes about 15 minutes, but it will stay warm on the stove while you’re waiting for the squash to cook. 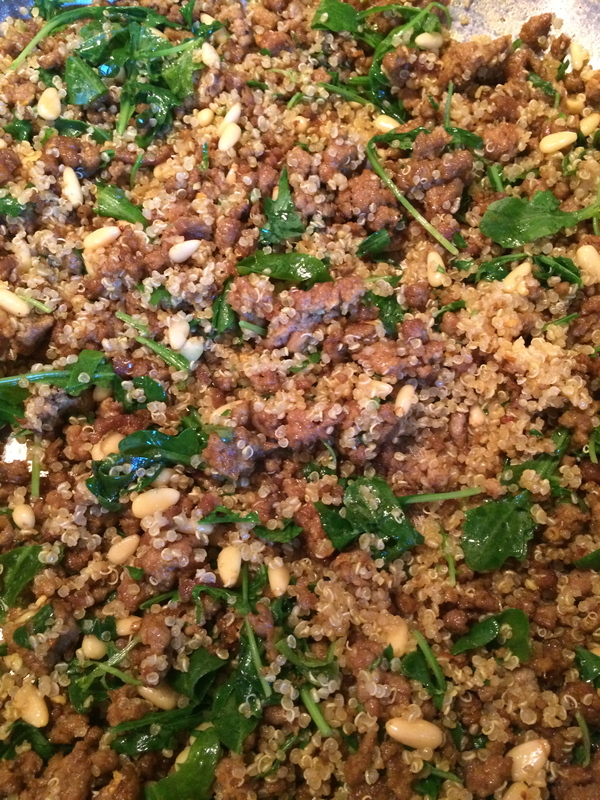 After your quinoa is on the stove, it’s time to brown the ground lamb. Start by heating up 1 Tb. of olive oil. When it’s hot, after about 30 seconds on my stove, throw in the lamb and use a flat-ended wooden spatula to spread it out. I love lamb, and try to eat it at least every other week. Ground lamb is a great alternative to ground beef. It’s flavorful, reasonably priced, and very versatile. Brown the lamb on medium high, and season with the remaining salt, pepper, and cumin. Cook for about 3 minutes. After the lamb is browned, turn the heat down to low. 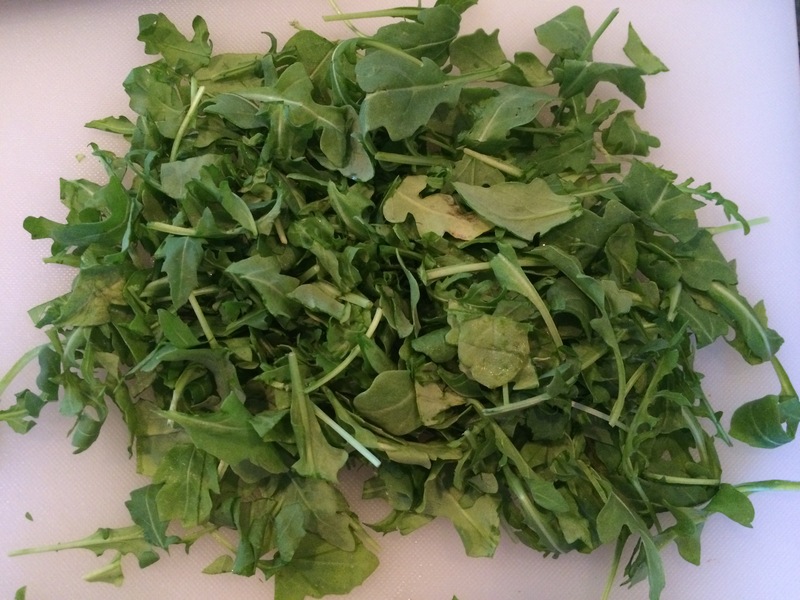 For a splash of color and nutrients, chop up the 2 cups of arugula. 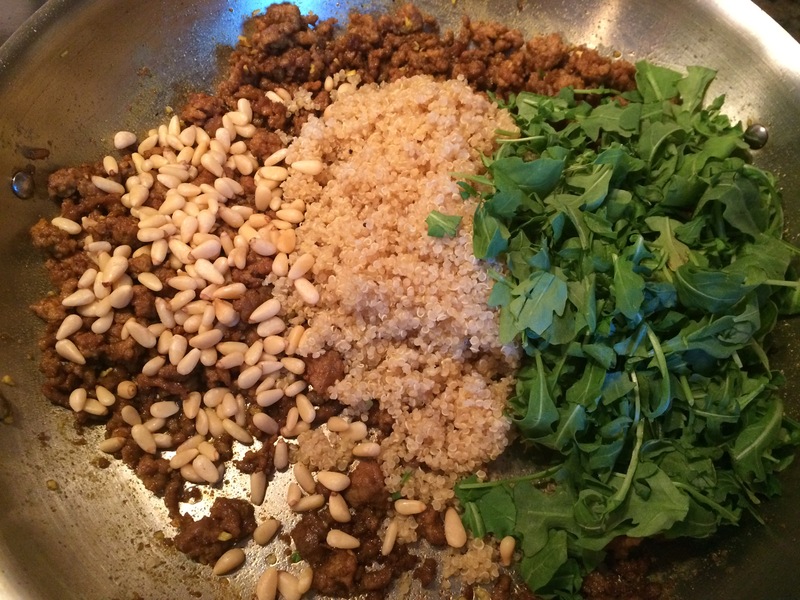 Now, it’s time to put all the lamb ingredients together: throw the arugula, pine nuts, and 1 cup of quinoa onto the lamb. And mix them up! After all ingredients are combined, turn the pan down to simmer until the squash is cooked. Once the squash is cooked, take it out of the oven. 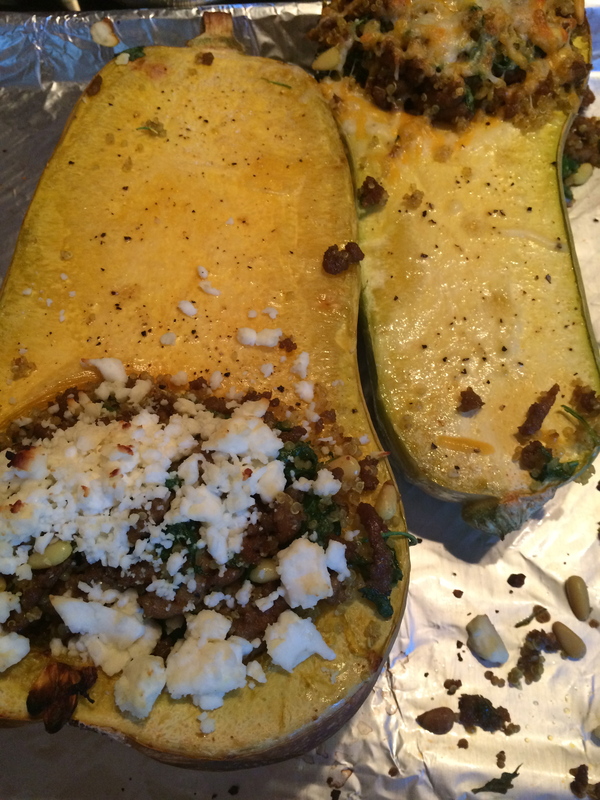 Stuff the squash with the ground lamb, and cover with cheese. Put the squash back in the oven for 8 minutes at 400 degrees. That’s it! 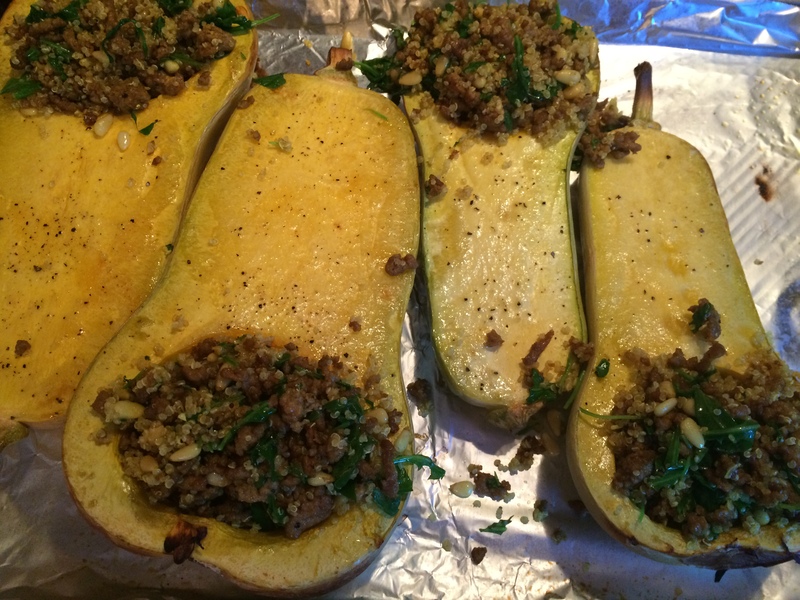 A delightful stuffed summer squash is now your delicious dinner. The next time your coworker brings you something from their garden, tell them “thank you”, and let them know what you did with it! I just got so hungry! And I’ve already eaten! (of course) I love that you used lamb. Love all the other ingredients as well.